Art comes in many forms, in many mediums and on many surfaces but nobody wants paint splashed across their property. When competing against street art at home or at work, our Calgary graffiti removal service is your best defence. The consequences of having a graffiti-stained structure can be much greater than just an unpleasant view. For a business owner, having graffiti staining your storefront can create a poor first impression to passers-by. Impressions are important and foot traffic can make or break your day. In a highly competitive retail climate like the one found in Calgary, every sale is important. Forming the right bond with your clientele is key. Something as simple as an offensive tag or symbol can make a negative impact. That is why our Gorillas offer free, fast removal of hate speech or racially offensive tags. Residential properties are not exempt from street vandalism either. Bare walls and blank spaces are open invitations to street artists. It doesn’t take long to be overrun with paint, staining and even damage. 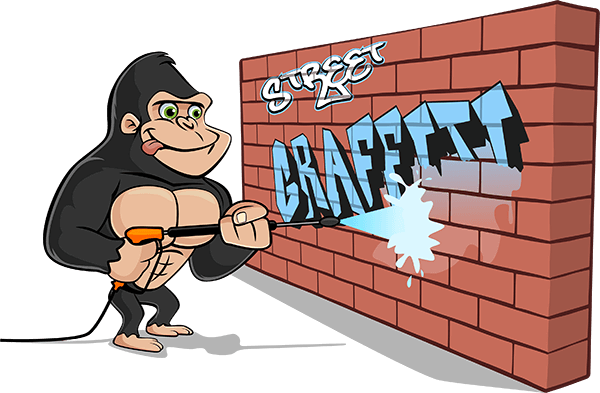 Our Gorillas put your property first with our Calgary graffiti removal service, offering timely and even routine service. If you find yourself in a neighbourhood or area that is prone to graffiti vandalism, our Gorillas are available to treat your property as often as every two weeks. Our Calgary graffiti removal service sets itself apart from our competitors with a practical system of trial and error. Over time we have developed a full proof system. Our Gorillas are trained to assess the make-up of your property and determine what the best treatment method is and what tools will give you the best possible results. Booking an appointment for your Calgary graffiti removal is as easy as picking up a phone, so don’t wait any longer!